Click here to view article as it was printed in CI Magazine (2.3MG PDF). To make sure your CI is heard, reduce 'miscommunication risks'. Ever had your CI poorly received or misunderstood? One of the challenges of competitive intelligence, or any research work, is correctly getting the message to the people who need it. This not only includes making sure the right people get the intelligence, but that it is correctly received and used. There are a number of things you can do to ensure a smooth intelligence handover and avoid the intelligence disconnect. It is important to realize that the CI job doesn't end when the intelligence itself is created. Delivery and full use of that intelligence are also the responsibility of the CI practitioner. It is also your job to ensure that no intelligence is lost during the transfer. Failure in these final stages of the CI process can devalue your work, along with the effectiveness of your firm. Poor intelligence dissemination can further trickle down to other aspects of your organization -- including the company’s bottom-line. Resources spent to support CI efforts are wasted if the intelligence is not effectively put to use. Regardless of whether you are an employee of an internal CI department or an outside consultant, you must take a proactive stance to ensure that you create an efficient working relationship with your customers, so that you both understand and meet each other’s needs. Below are four steps for reducing the risk of poor communication and avoiding the "intelligence disconnect." Whether you are working for a company as a consultant or an employee, make sure that you understand what is being asked of you. Unless you work towards the goals of your customer, there is a chance they will not want your product, regardless of how valuable you believe it is. If it's not what the customer was expecting, then it's not what was needed. Pay attention to what the customer is asking and cater your intelligence so that it directly answers those questions. Realize that you have a customer and are working to meet their needs, not necessarily your own. If you believe that your client does not fully understand what you can deliver or what may be needed, it is your responsibility to take the time to educate them. The best way to handle this is to create a Statement of Work (SOW) and use it as a template for what you deliver. The organization of the SOW often indicates what is being asked for in the order of importance. If you use this as the outline for the intelligence you generate, you will have the greatest level of success at directly addressing your customer’s concerns. The process of creating a Statement of Work will also give you the opportunity to work with your client, educating them and helping them to understand what can and cannot be delivered. When reviewing the Statement of Work, you should be confident that your customer will act on the intelligence you provide. If your customer is not fully committed and prepared to act on the CI gathered, then the project may already be at risk. Be sure to pin them down as to what they can and cannot use, so there are no wasted efforts. Use this stage to clarify your process so that your customer is familiar with your plan of execution. If your customer knows and understands your approach, they will know what to expect and your timeline for producing the intelligence. This is all part of setting the proper expectations so there are no “let-downs” later in the process. It is extremely important that you know your audience. Are you communicating with the right person? Are you relating the intelligence in the correct way? Not paying attention to your audience severely hampers your ability to communicate any intelligence you have gathered. As a CI practitioner, you may have better insight into what can be done with the collected CI than the person who originally asked for it. Use this experience to answer these questions and maximize the use of your CI. Through the course of CI gathering and analysis, pieces of intelligence often surface that may not be useful to your direct customer, but which could still have value elsewhere within the company. Ask your customer directly if they know of anyone else who could benefit from the intelligence gathered. Once you have the right person, how do you get your intelligence across? How does the recipient need to have their intelligence packaged for maximum effectiveness? Taking the time to know and understand how your client operates gives you the advantage in meeting their expectations. Although you may be delivering the right information, you may not be delivering it in a way your client is used to consuming it. Even if you have the correct deliverable, a busy customer may unfortunately discount much of it if it is not presented properly. Rather than placing blame on the recipient, try to understand the way they need to work. It is the job of the CI practitioner to find out how the customer works and identify the best way the material can be presented. Understanding how your client operates will help in meeting their expectations. It is also important to know your client’s level of understanding. What is your customer’s experience level? Talking down to an experienced individual is as bad as over-estimating their knowledge. Close attention to your customer’s degree of understanding allows you to deliver intelligence in the most beneficial way. Think of the extreme analogy of a first grade teacher speaking to a class of college students, or a college professor trying to communicate with first graders in the manner he or she usually teaches their class. Regardless of the subject matter, the approach to conveying information plays an important role in how it is absorbed. Delivery of intelligence has two major attributes: timing and mechanism. Paying careful attention to both of these will further reduce your risk of communication difficulties. The good news is that if you followed the first two steps, it will help you to determine when and how to deliver. It is often said in the CI field that it's more important to be 80% right and provide enough time to act, than to be 100% correct after it is too late to do anything. Better to be 80% right with enough time to act, than 100% correct when it's too late. It is important that you look at the subject matter you are dealing with and decide whether to make the trade-off between confirmed accuracy and timely delivery. In my previous consulting work, I provided technical due diligence for venture capitalists and other stakeholders. I realized early on that a brief, timely, and focused analysis was preferred over a lengthy, in-depth, and more complete alternative. For these clients, the additional time required to cover every aspect and be 100% confident of the findings was not worth delaying the investment opportunity. We subsequently developed a process for capturing 90% of the risk areas in a two-day timeframe. But be careful: the time over accuracy tradeoff does not always apply. Sometimes complete accuracy of the information is imperative. If, for example, the proactive actions warrant substantial resources, additional accuracy is often preferred to avoid costly mistakes. It is again the job of CI practitioners to understand their clients needs, so as to determine where the line between "confidence in accuracy" and "delivery timeliness" should be drawn. To help you gauge your project, use the 80/20-rule extension of Vifredo Pareto’s principle.2 That is, 20% of your time will often deliver 80% confidence of accuracy, but the final 20% level of accuracy will consume 80% of your time. Weigh the gains achieved by that last 20%. The key to CI delivery timing is to determine when you have reached the accuracy level required, and when you must deliver the information so that an appropriate plan can be developed. The mechanism used to deliver your CI will also determine how much of your intelligence is absorbed by your client. Sometimes the right intelligence won't get through to the customer if it was not delivered in their format. Choosing the mechanism for CI delivery is a combination of knowing your audience and the CI you have gathered. Again you need to refer back to both your Statement of Work and what you know about your client. In general, a combination of both written and verbal delivery often is most effective. A written report followed up by a Q&A session can provide excellent results. Allow enough time for the consumer of the intelligence to review the findings and prepare useful and focused questions. Whether you are delivering your report in person or over the phone, make sure the timing is right. If you rely on impromptu calls or meetings, expect that your customers may not be in the correct state of mind to digest what is being told to them. If possible, schedule a set time where all parties involved are prepared to discuss your findings. Early morning is preferable to the afternoon, as you can catch your client before other issues tend to cloud the day. Be sure to keep it concise and to the point, when making verbal presentations. Important intelligence points can be lost when too many issues are discussed or are surrounded by unimportant commentary. An audience will tend to eliminate “noise” and only be able to discern a few of your points. Unless your customer is taking accurate notes about all of the issues you bring up, be prepared for some of them to not be entirely absorbed. A written report produces a lasting record of your intelligence work. Keep this in mind as you put it together. What you write is likely to be referred to for some time to come. It may even be used when performing a "post-mortem." Remembering this, you will be motivated to put a little time and effort into making sure that you are expressing yourself in a way that avoids any possible misinterpretation. Write your report in a way that can be easily understood by your audience. Again, knowing your customer provides clues on whether to use quick summary bullet lists, or detailed descriptions of all of your findings. If you have to provide a single report for use by different audiences, provide ways for each to access supporting information if needed. There are a number of successful tactics I have adopted to deal with various audiences. For example, glossaries and cross-references serve up additional information without cluttering things for those who just need the straight facts. Always provide a summary of the entire report upfront that is brief and to the point. These methods provide a quick synopsis, while also allowing follow-up on any items on which a customer may require more information. Good grammar means clarity and precision. Stay focused on the message. Be prepared to edit repetitive phrases and overly long sentences. Avoid jargon or “industry speak.” Be careful not to inundate your readers with unfamiliar acronyms and abbreviations, and always define those used. In this way, you don't limit the audience who can access the report. As it will not be such a chore to read, the absorption rate will increase. Include your current contact information at the end. Always indicate that you are available to discuss any of the contents of the report. You should encourage your customers to consult you if they have any questions or are unsure about the meaning of any item in the report. Allowing an open-door policy for discussing your CI is part of the process, but still falls short of what's needed. It places the entire onus on the client. You will need to proactively follow-up with your customer to see if your CI is being used appropriately. Lack of use, or misuse, of intelligence is an indication that it was not correctly conveyed. Take it upon yourself to schedule regular follow-up sessions, either by phone, e-mail, or in person. Through these meetings, you can clear up any misunderstandings and further improve your processes. Every session can increase your effectiveness as a CI practitioner. Touch on each one of the bulleted or highlighted points in your report. Get customer feedback on how the information was understood and used. This exercise reveals if the communication was received accurately. Ask what action was taken, or is intended to be taken. These sessions can also be a forum to bring up new intelligence issues that can be further developed. A customer who understands and uses the intelligence provided will recognize the need to keep receiving more input, as new information becomes available. When you help create this type of client, you have avoided a "disconnect," and kept the lines open for further deliveries. Does your SOW cover the following? What is the priority of these deliverables numbered 1-n? Who else should be copied on correspondence? What is the requested frequency of status reports? What assumptions are trying to be proved or dispelled? 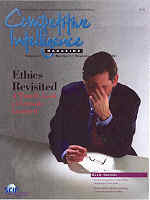 1 Neil J. Simon's Managing the CI Department column, "I Got It, Why Don't They" in Competitive Intelligence Magazine, 4(3), May-June 2001, contains a helpful table to assist you in knowing your audience ("Seven Kinds of Smart: Ways of Working Together," p. 40). 2 The 80/20 rule is attributed to Vifredo Pareto (1848-1923), an Italian economist who formulated this well known principle: "In any series of elements to be controlled, a selected small fraction in terms of number of elements almost always accounts for a large fraction in terms of effect." The 80/20 rule extends this principle to real-world situations in which there is a question of effectiveness versus diminishing returns on effort, expense, or time. When it comes to CI, it can be paraphrased as "absolute perfection costs too much." Copyrights: The copyright in all materials provided on this web site is held by Predictive Research Group or by the creator of that material. None of the materials may be copied, reproduced, distributed, republished, downloaded, displayed, posted or transmitted in any form or by any means, including, but not limited to, electronic, mechanical, photocopying, recording or otherwise, without the prior written permission of Predictive Research Group or the copyright owner.